New Delhi, Sept 21 (PTI): Rajnikanth's latest blockbuster "Sivaji -- The Boss" is set to complete its 100th day tomorrow in 111 theatres in India and abroad and the Tamil superstar's fans are planning celebrations to mark the occasion. The film was released in 235 theatres across Tamil Nadu and as many screens outside the state on June 15. "Around 102 theatres in Tamil Nadu will celebrate the 100th day of screening the movie on Saturday," AVM Productions CEO S C Babu said. "The film is still running in almost 10 to 20 per cent of the theatres it which it was released outside Tamil Nadu, especially in Kerala and Karnataka," he said from Chennai. One theatre in Mumbai is set to celebrate the 100th day tomorrow. Outside India, the film will complete 100 days in six theatres in Malaysia, two in Sri Lanka and one in Singapore. The latest hit from Rajnikanth, who has a huge following in Tamil Nadu and abroad, broke records for collections by a Tamil film not only in India but also in countries like Malaysia, Singapore and Britain. The film is still collecting 7,000 pounds a week in a theatre in Britain and there are a lot of inquiries for the rights to dub the film in Malay, Chinese and Japanese. "Sivaji" is also making huge collections in over 10 theatres in Chennai and its suburbs. Munikanniah, vice-president of Sathyam Cinemas, a leading multiplex in Chennai, said: "The distributor's share for 'Sivaji -- The Boss' in a single theatre in Chennai was Rs 1.55 crore, which is an all-time record for the state." "The film was released in two screens in Satyam Cinemas simultaneously with a seating capacity of 948 and 560 seats and it ran to packed houses for nearly six weeks," Munikanniah said. "Even now, with the film nearing its 100th day, almost 60 per cent of the 948 seats get filled during weekdays and 100 per cent during weekends." Though "Sivaji" is running strong even after three months, the film's producers have no plans for celebrating its completion of 100 days. "The film is running very strong even now and we don't want to spoil it by celebrating the 100th day. We hope the film will continue to create more records," Babu said. "We will have a bigger celebration later," he said. But the star's fans are gearing up to celebrate the event at theatres. "We have planned to celebrate the occasion in a grand manner outside theatres in Bangalore and Malaysia," said J Ramki, co-founder of rajinifans.com, a website dedicated to Rajnikanth. "This is the first time an Indian language movie will complete 100 days in Malaysia. 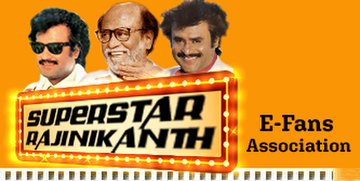 Rajnifans.com will celebrate it in a big way in front of theatres." Munikanniah said, "Many fan associations have sought our permission to celebrate the event outside theatres. They will distribute sweets and watch their 'thalaivar' (leader) on screen again." Sundar, an ardent fan of the star, said, "We will distribute sweets and food packets to people who come to watch the movie on Saturday." Referring to plans to release a Hindi version of the film, Babu said, "dubbing for the Hindi edition has already started and it is likely to be completed by the first week of October. "Director Shankar is very anxious that Rajnikanth should dub his own voice for the Hindi version but it is for him to decide. "As announced earlier, the Hindi version will have a post-Diwali release." "Sivaji" is about a man's fight against black money in society, with Rajnikanth playing the protagonist in his own trademark style with a combination of punchy dialogue, comedy, romance, songs and colourful costumes.